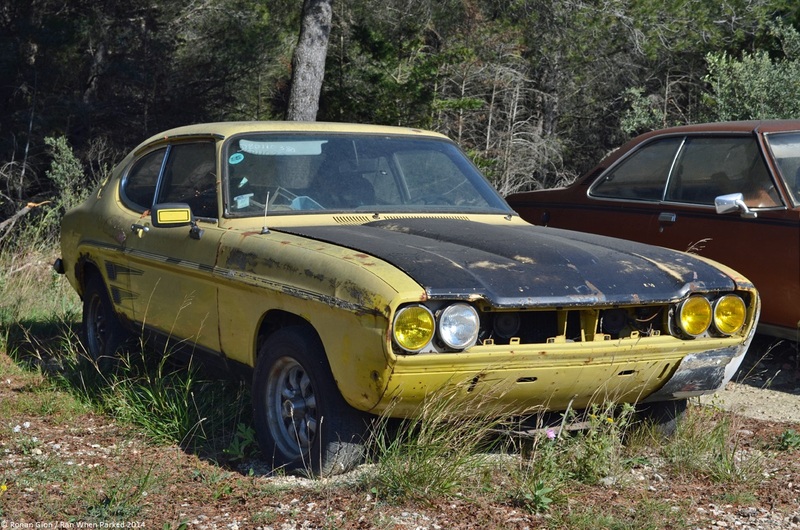 This Ford Capri RS2600 is one of three vintage cars ending their lives on a small plot of land located next to a gas station in southern France. The license plate tells us the coupe was first registered in 1973, the best year for mk1 Capri sales in Europe and the same year that Ford built the one millionth Capri. The roughly-sanded composite fender flares on the driver’s side of the car indicate it fell into the hands of a racing enthusiast at one point in its life, though it’s hard to tell whether it was actually raced or merely a victim of the tuner scene in the 1980s. Marks on the passenger side of the car show it once had a full set of flares, and similar traces of glue on the trunk lid reveal it was fitted with a presumably large spoiler. The Capri has been off the road for over a decade and rust has started to chew away at its rocker panels and wheel arches. It’s 90-percent complete so we imagine it wouldn’t be too difficult to get it back into shape provided the original 150-horsepower fuel-injected Cologne V6 engine is still under the hood and in sound shape. Tags: Capri, Ford, Ford Capri RS2600. Bookmark the permalink. I’ve always loved the Capri and would dearly love one but sadly I have no skills with a welding set which is what would be required to restore this beauty. However there are plenty of very skilled people who could return that car to as new condition. I’m really surprised and saddened to see it rusting away. Any chance of the owner being willing to pass on its details to the Capri owners club in the UK to see if somebody would be interested in restoring it? Elle ce trouve dans quelle ville cette capri ?